I insert the shims when the board gets flipped so I can resaw twice the saws capacity. Yeah the front design on the M12 looks the same I would assume it will perform very much the same as the M18 poorly. I wouldn't take the risk if I was you unless you are able to get a hold of one and have a play around with it first. The battery life on the M18 isn't bad last long enough so for cutting plywood on site or something rough its perfectly fine. I tried resawing on my CMS-unit with the original Carvex PSC400 mounted in the CMS-PS insert upside down and using the CMS-TS55 fence as the guide fence. That didn't pan out very well due to the PSC400's inherent blade drift after about 5cm into the 2x4 board. This was most likely an attribute of the original Carvex's broken blade guide system so it actually might work with the 420. Haven't had a chance to try this yet on my PS420, but my wife did some 'scroll sawing' of door signs out of 6mm plywood last weekend that actually worked unlike with the PSC400. Okay, here is my cheap version of a router/jigsaw table. It is made from plywood with maple edgeband, it is mostly going to be used as a router table for site work but i figured while i was doing this i might as well add the jigsaw mount. Even though i used quick clamps i wanted something more secure so i added the wooden piece that is screwed in because i really don't trust the cheap plastic clamps that i found in my shop. I don't plan on using this very often, just the couple of times during the year when i forgot to do something in the shop or when the need comes up. I made this to attach to my miter saw stand but it can be clamped to just about anything in a pinch, when it is on the stand it also rests on the handle so it is actually supported on the front also. This is in no way a precision piece but is was made with scraps in the shop and it does not take any additional room in my trailer. Okay, here is my cheap version of a router/jigsaw table. Good thinking to show this demonstration with a Bosch. Looks good. I plan to make something similar. Even I, who do almost everything with a jigsaw, would not attempt to re-saw lumber with one. So has anyone bought the neutechnik jisaw table? I am considering getting the full kit to use with my P1cc. I could have done with one last week as I had to scribe rip architrave. Done it freehand but that table would have saved a lot of messing around. Just like jmb said it would be useful for scribing lengths of architrave and skirting. Also ripping down small bits of wood etc. I don't ever take a table saw on site and this looks easy to set up and is compact to store and carry. If anyone has used one I would like to know their views and experience. ...companies like Festool (and Bosch/Wolfcraf, etc.) stubbornly persist in offering substandard jigsaw tables (that lack an overhead blade guide & above-the-table dust collection)? I mean, just look again at what the poor bloke in the above photo had to cobble together just to make his jigsaw module* safe and (therefore) usable! Like the MFT/3, the CMS table features a beefy extrusion that runs right round its perimeter - a great place to clamp an overhead arm assembly akin to what was included in the Triton jigsaw kit (such an assembly could even clamp to three sides for added stability). But, alas, such a worthwhile accessory doesn't exist. My disappointment over this glaring absence is not unlike what I feel having just stumbled upon the fact that a) there was an earlier iteration of the CMS system (called "Basis") that b) featured not only t-slots on the face of at least three modules but c) a pull-saw module (!) that benefitted from proper knobs for raising, lowering and tilting the blade! Knowing this, how are the current CMS-TS modules (and the CMS base table itself) not a perfect example of devolution (rather than evolution)? Why are such worthwhile features missing from the CMS family? Anyone? FWIW I am a (now somewhat disillusioned) owner of a CMS GE router table and a TS 75 module and someone who thought long & hard over the Precisio(s) and Mafell Erika (pull saws) before ultimately deciding on the CMS. And, similar to other dedicated CMS-TS owners, I've had to jury-rig a featherboard to the face of the miter gauge (the lack of even a single t-slot in the table unnecessarily complicates the addition of this obligatory safety feature), live without the safety benefits and added utility of a pull saw and fiddle around with setting blade angles. Plus, I've also decided against adding the CMS jigsaw module (and what would have been a new PS 300 EQ-Plus jigsaw) to my existing Festool collection. I'll stick to my Bosch, thank you very much, and devise something to incorporate a Neutechnik table into my CMS (building upon the former's blade guard/guide and above and below-the-table allowance for dust collection). The CMS system other than the router table is of questionable value unless someone is just intent on using all Festool even though better products exist. I have the CMS-VL and am happy with it. I keep an OF1400 in it and can change bits with it in the module. On the other hand tablesaw module is nearly 100% inferior than a small portable tablesaw. There are several models to pick from, but I have found the DeWalt ones to be the best with their geared fence, which once setup guarantees square cuts + easy repeatability. Easier and quicker to setup. Same footprint as the CMS module. Is inclusive meaning everything you need to use it is included. The CMS requires more accessories to make it work. Similar or slightly larger capacity. Dust collection not as great. Depending on what you are cutting you might need to make a simple outfield table. I used a stack of systainers. ...and, of course, their extra-long jigsaw and specialty scroll saw blades. All of the above and more (like the regular jigsaw guide head and some other gizmos) are included in the Neutechnik Jigsaw "Super Set", from which the various needed bits I am about to expound upon could be cannibalized (possibly offering some savings over purchasing the necessary parts separately). Used (often very lightly used) examples of the "Super Set" appear on ebay.de practically weekly and sell for about half what the same set new goes for. Anyways, here's my thought - the first item on the above list is designed to be bolted down to a work surface (IOW it is surface mounted) and it features what amounts to a customizable-length boom arm. I see this working well in conjunction with either a Festool Crown Stop (494369) - bolt the arm to the surface of the crown stop and then attach the co-joined assembly to the extrusion on the offcut side of the table - or, if you already have one (which I happen to), in conjunction with the Festool Extension Table VB-CMS (493822); simply bolt the Jumbo Saw Extension accessory to the extension table (or, better yet, to a piece of plywood that clamps to the ext. table, the former maybe fitted with dual t-tracks to allow the Jumbo Saw Extension to slide along the lines of Tom's recent improvement to the combination of the CMS router fence and Woodpecker's Micro adjust). Elevating the Jumbo Saw Extension on top of a section of plywood would also compensate for the absence of the Neutechnik table (with its thick profile). And, with the overhead boom arm mounted on the off-cut side of the table, the jigsaw module could benefit from the sliding table and miter fence as well as the Festool Stopper (a.k.a. "full length rip fence") LA-CS 50/CMS (492095). ...that would be a proper jigsaw table! Darn it! This has me rethinking my opposition to the combination of the CMS-PS module and PS 300 jigsaw! 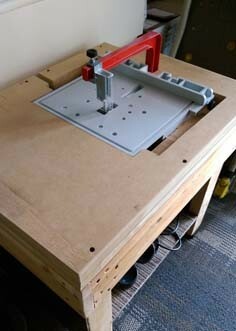 A jigsaw in a table is a scroll saw & you can pick up a used one of those for a lot less money & effort than a carvex is some custom table is going to run. Ahhh @Shadytree...your suggestion assumes I have space for and/or want a dedicated machine (neither of which I do). Hence my focus on coming up with a work around for the CMS that allows me to make multiple uses of a single tool (a jigsaw). As others have pointed out before me, the real utility in the CMS unit comes from exploiting its potential. Along these lines, I've got a drill stand module in mind and, thanks to inspiration from other CMS aficionados on this forum, belt sander and RO sander modules as well. To each their own, right?